•	Commerce Minister Suresh Prabhu honoured outstanding young entrepreneurs with National Entrepreneurship Awards in New Delhi. •	The awards aim to recognize and honour outstanding young first-generation entrepreneurs and those who have contributed immensely in building the entrepreneurship ecosystem. •	A total of 43 awards were given this year. Speaking on the occasion, Mr Prabhu said, the government will provide full support to the young entrepreneurs to enhance their business. •	The Commerce Minister said that government will provide a market through Government eMarketplace, GEM for their product. 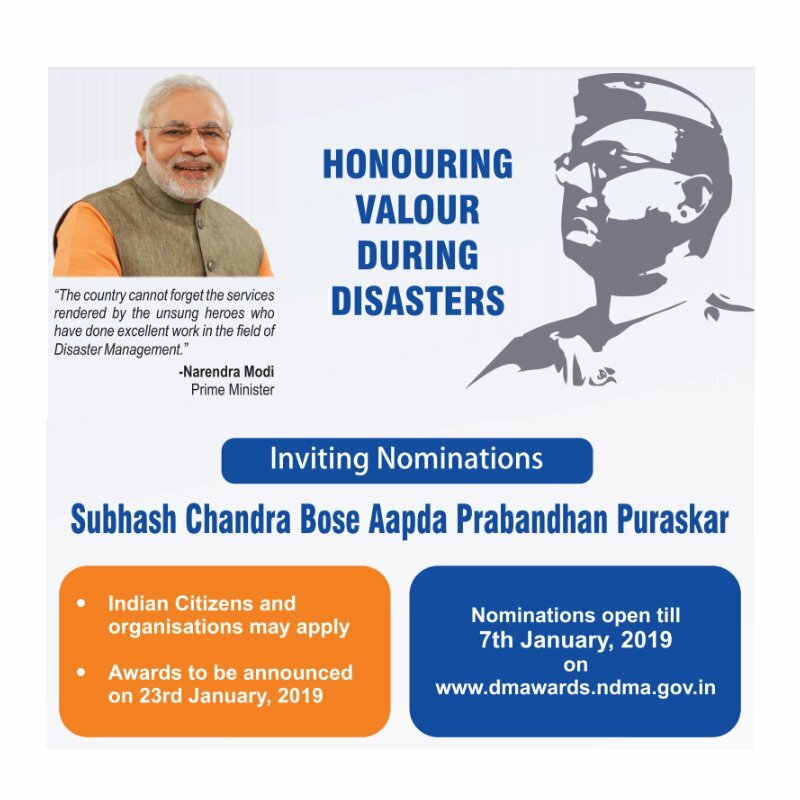 •	These are annual awards instituted recently by the Centre to recognise the excellent work done by individuals and institutions in the country in the field of disaster management. •	Three eligible institutions and individuals will be given the ‘Subhash Chandra Bose Aapda Prabandhan Puraskaar’ every year with cash rewards ranging from Rs 5 lakh to Rs 51 lakh. •	If the awardee is an institution, it will be given a certificate and a cash prize of Rs 51 lakh and the prize money will be utilised for disaster management-related activities only. •	If the awardee is an individual, the person shall receive a certificate and a cash prize of Rs 5 lakh. •	An application by an institution does not debar any individual from that institution to apply for the award in his individual capacity. •	Only Indian nationals and Indian institutions can apply for the award. •	For institutional awards, voluntary organisations, corporate entities, academic, research institutions, response, uniformed forces or any other institution may apply for the award. •	The applicant must have worked in the area of disaster management like prevention, mitigation, preparedness, rescue, response, relief, rehabilitation, research, innovation or early warning related work in India. •	The application must be accompanied by details of the work done in disaster management and must highlight achievements in any one or more of the areas like saving human lives, reduction in impact of disasters on lives, livestock, livelihoods, property, society, economy, or environment. •	The Mohammed Rafi Award has been bestowed upon late music composer Laxmikant Shantaram Kudalkar and playback singer Usha Timothy. •	The award was instituted by an NGO headed by Mumbai BJP Chief Ashish Shelar. •	Kudalkar, of the Laxmikant-Pyarelal duo, was given the Mohammed Rafi Lifetime Achievement Award consisting of 1 lakh rupees and a trophy. •	Timothy was honoured with the award and 51,000 rupees at a programme held in suburban Bandra. •	Kudalkar formed a successful and long partnership with Pyarelal Ramprasad Sharma and as music composers they belted out hit tracks like `Bindiya Chamkegi`, `Main Shayar Toh Nahin` and `Hansta Hua Noorani Chehra` among others. •	Timothy has sung 1,000 songs in multiple Indian languages such as Hindi, Malayalam, Punjabi, Bhojpuri and Marathi, among others.